The animosity coming theses days from some elements in Amhara region against Tigray people, all that venom and anger used to be directed at “secessionist” Eritrea years back. And now that Eritrea as a sovereign state has offered the use of its ports, the political calculus has changed…Certainly Eritrea and Tigray region border crossing of people and goods needs to be regularized. Abrupt closing of the border recently without explanation to the people was disruptive. There is also the sensitive matter of the people in the border towns whose future, as Ethiopians or Eritreans, is yet to be sorted out. It is very easy to be vindictive, but what is needed is more political leadership and goodwill, to see again the kind of celebration and relief people showed reconnecting with family and friends in the recent border opening. Dr. Mehari, a good academic as you call it yourself. An academic does not use references from articles that are posted above. Those articles are not academic. They are just baseless arguments. If you are an academic, you need to get to the ground and find out who was living in Badme and its environs. I was born in Adi-Nebrieed, inda Iyesus. I am an Eritrean by father (came Adi-Nebrieed while young) and Tigryan by mother. I know Hayelom and his elder brother when I was a child. Then at 6 years old, in 1951 EC, when Locust cleaned all farmes in Adi-Nebrieed and other Tigray places, my family left for Badme. I grew up, was educated elementary school there, and then went to Barentu for further education. I know the houses, the shops, places of drink in Badme and all its environs until Sheraro. It is shame when you say people are divided when the border is delimited. Which people. Where were those people before the war broke? It is true that Badme was being administered by Tigray. However, the people who lived in Badme and all the way to Gemhalo and Biara are all Eritreans. How long will you guys lie. It is good to be honest and live in peace. I am 100% sure you have not even heard about Badme until the war broke, and now you are staggering to put lies together to look a politician or as you call it academic. Please stop and stop. Do not fabricate History. History can speak for itself if it gets a ground for truth. Throwing development money to the northern Tigray region on border with Eritrea amounts to bribing the border people to choose Ethiopia instead of Eritrea. Abiy Ahmed decisively answered this question. 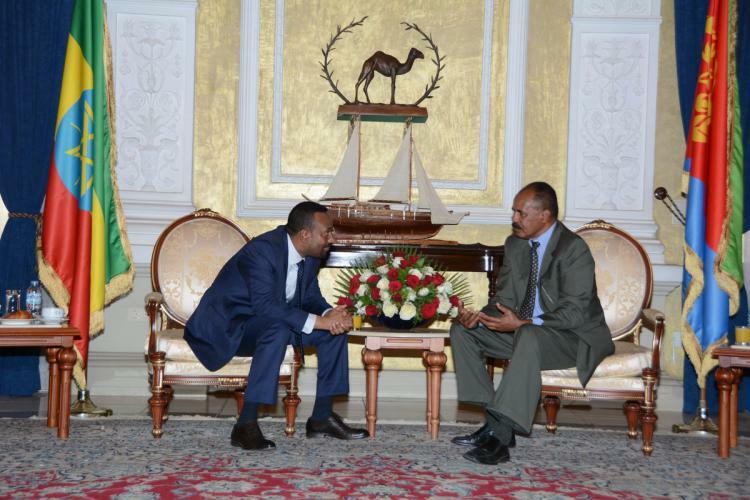 He said ‘border people’ can not decide to be with Ethiopia or not. Ethiopia is economically poor, largely because Tigray and Amara are cyclically the most violent regions and don’t pay gov taxes. Most parts of regions were held by rebels between 1974-91, therefore gov did not collect income and business taxes. Last four years, Oromo and Amara also became unstable; therefore Ethiopian economic productivity went downhill. State poverty does not absolve it from its responsibilities. It borrows from WB, IMF, UNDP, local lenders, and asks international for aid by shamelessly falsifying drought and famine figures. It has fragile old-age pensioners, income support for the families of the war dead in Ethiopia- Eritrea war, maimed and disabled soldiers as well as disabled TPLF gorillas. It has to support those who live in the arid regions of Ethiopia such as Afar, Harar and Ethiopian Somali. It’s helping nomads in their transition to a sedentary farm life style. The border people in northern Tigray are not vulnerable people to qualify for humanitarian assistances as those groups mentioned above. This is the best article I have ever read regarding this issue. Our people need peace and economic development. common enemy, the Derge and the Emperor. I thank you for your brilliant article and God bless you. What a hack! Your bias in favor of Ethiopia screams loud and clear. Self-analysis/soul searching is advisable. You keep citing your concerns about the border population. You want to hold millions of Eritreans hostage because of the wishes of a small border population. Take a hike. Very interesting article. Well done! It doesnot work. Esayas. The black. Dr.Mehari, that’s actually a locust sratement….parasitic..instead if living within your own means and merit. Other than suggesting to live off Ethiopia, you have not provided what your tiny country wiukd provide to Ethiopians, who want nothing from you. We are already hosting a million of your refuges. Eritrea hazbecomeaburden on tge taxpayers of Ethiopia. Hadgi is for the ppl like u. Reset you mind and engage, positive dialogue, think of positive development that both ppl started enjoying social nd economical renaissance. Well said Dr. Mehari. I just wish the leaders of both countries understand that any border related issues can be resolved only if those who live in the area with plans that are developed to resolve the issue/s. One sided ,not trustworthy not based on fact rather hypothetical writing. some ethiopians live in delutional and denial world rather than accept the world like it is.